Just above 2000 years ago, a Jewish Rabbi by the name Jesus Christ, who we Christians hold in high esteem as our Savior, stated: I give you peace, peace not as the world gives you, but peace that radiates from inside and impacts on the world. The world since time immemorial has sought peace, but that goal has remained elusive because the world has sought to create peace using instruments external to the human heart. Examples are weapons of war, diplomatic negotiations and several other strategies found in the politician’s arsenal. Whilst all of these strategies are noble, they miss the most important way of building peace in the world. That is, building peace first in the hearts and minds of humanity. This is the kind of peace that Jesus Christ, and indeed many of leaders of the great religions of the world, taught about. This is the kind of peace that UNESCO seeks to build in the world. In the following paragraphs shall be answered two main the questions: what it means to build peace in our hearts and minds; and how that peace building process impacts on the world. But what is peace? It has been eloquently stated by Dr Martin Luther King, Jr. that peace is not just the absence of war. Indeed, peace is a state of physical, social, economic and psychological well-being. It is a state of good neighborliness that respects the common brotherhood and sisterhood of humanity. It is born out of love of self and love for others. It emanates from tolerance of diversity. It comes out of respect of human rights such as freedom of choice, freedom of worship, freedom of expression, freedom of association and many other such. What then does it mean to build peace in our hearts and minds? Many belief systems are agreed that the terms heart and mind refer to our inner soul, our inner self, our thought processes, our feelings, emotions and perceptions of ourselves and the world around us. Peace-building must certainly begin in the deepest recesses of our hearts and minds. What we believe about ourselves, our God or gods, others and the world around us has an enormous impact on the world’s peace and peace building processes. An example can be cited from my country, Botswana, and African in general. We are a diverse country and continent, in terms of ethnicity, race and religion. Due to failure many times to accept our common brotherhood and sisterhood, we have found ourselves upsetting or frustrating the peace of the continent. Our failure to accept each other’s diversity, belief systems, thought patterns and perceptions of the world has many times led to conflict. This arises from deep within our hearts. If we cannot accept ourselves for who and what we are, and accept others for who and what they are, we begin to magnify our differences, which usually leads to conflict. Love for ourselves and love for our neighbors, that famous dictum preached by almost all of the world’s great religions, is the means to building peace in our hearts and in the world. If I love my neighbor as I love myself, I will not seek to hurt my neighbor. Where we have disagreements I will build bridges and mend fences. In my family, love is an important part of our life. It keeps bonds of family strong, and helps us keep the peace. Similarly, in a world in which love rules, peace prevails. Building peace in our hearts and minds must therefore mean building love in us. Love softens human hearts, leads to forgiveness and fosters acceptance of diversity and respect for human rights. As many of the world’s belief systems affirm, love in our hearts can be built through educating our minds. Education builds better communities, richer cultures, and through advancing science, brings economic, social, cultural and psychological well-being to the world. Building peace in the world must therefore begin with building peace in our hearts and minds. Peace is more than the absence of war. It is a state of complete human well-being. If the world is to realize peace, if first has to build it in our hearts and minds. That can only be accomplished through nurturing love in our hearts, which can only be accomplished through educating our minds. Kampala, Uganda, 12 - 16 September, 2016. African Writers Trust (AWT) is pleased to announce its 4th edition of the Editorial and Publishing Training Workshop. 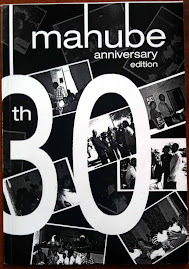 Applications are invited from writers and editors from Uganda, Botswana, Malawi, Namibia, Zambia and Zimbabwe. Bring together writers and editors as part of AWT’s wider mission to build and sustain a network of African writers. AWT will cater for all successful applicants’ travel expenses, accommodation and meals for the duration of the workshop. Participants will be expected to pay a registration fee of USD 50 and are required to bring along written material (fiction or non-fiction) to work on during the training. All successful applicants will be expected to be fully present for the entire duration of the workshop. The deadline for receiving applications is Sunday 10th July, 2016. Applications received after this date will not be considered. Successful applicants only will be notified by Sunday the 31st of July 2016. WABO invites aspiring writers to participate in this year's Bessie Head writing competitions. Below are the guidelines as stipulated by the competition organisers. This year, the Bessie Head Heritage Trust is offering a short story competition. No novels, poems, or children's stories will be accepted. All stories must be submitted online tobessiehead@gmail.com. Note that this form of submission is new. We will not accept hard copies this year. All submissions must adhere to the following guidelines. Those submissions that do not will be automatically disqualified. All work must be original and unpublished. All work must be in English and have been thoroughly revised and proofread for grammar and spelling. No school assignments will be accepted. All submissions must include a cover page with name (no pen names will be accepted), two reliable ways of contacting you (email, postal address, telephone number, cell number), the title of the story, and an accurate word count. The word limit is 5,000 words. The first page of the story must also include the title of the story. The rest of the submission must not contain any identifying information. Except for the cover page, all submissions must be anonymous. Use a single, clear font, 12 point size. The best font to use is Times New Roman. Use clear black text on a white background. Left-justify your paragraphs. Right margins should be "ragged". Don't insert extra lines between your paragraphs. Put the word "End" at the end of your story , centred on its own line. Authors are advised that they may be asked to authenticate their work. Do not destroy any drafts, as you may be required to produce them as proof of originality. All submissions must be attached to an email as Word documents (.doc or .docx). Email your submission by 15 September 2015 to bessiehead@gmail.com. All submissions will be acknowledged. No late entries will be accepted. This competition is open to citizens and residents of Botswana. Winners may be asked to verify their identity and eligibility. DEADLINE: 15 September 2015 Winners are barred for three years from submitting manuscripts again in the same category, though they may enter other categories. Bessie Head Heritage Trust members, The Trust acknowledges the rights of copyright in the manuscript and the lawfulness of the copyright holder's rights and title to the rights of copyright in the manuscript. Your mastery will unfold when you have developed the ability to recognize that there will always be something that you have to go through, and you use every bit of that going through, to polish the master within. However, what many people do unknowingly is they take time away from their dreams and ambitions and work on the problem they have, because they feel that problem keeps getting in the way, so they prioritize it. So instead of being guided to live from the spirit within, they take direction from the current circumstances. And believe me I have done this so many times till that it actually started to create more things for me ‘to go through’ taking me further and further away from concentrating on me. It took me a little while to recognize these forks in the road that led me back to guess what, my problem and a whole bunch more waiting to have their say. Now I know these sound more like reasons instead of forks in the road but that is just it; the person that has learned to master success in what they hope to achieve sees those reasons as forks that will take them away from what they intend to have, so they use that opportunity to find the new awareness that allow them to keep moving forward. Ask any successful entrepreneur and they will tell you that when challenges come they don’t dial down the dream because of setbacks or disappointing results. No! Instead they learn to dial-up the passion and awareness to help them create what it is they are looking for and so much more. They change the way they see things and so the things they see begin to change. You’ve done this yourself many of times but you are mostly unaware of it. Just think for a moment about a challenge you may have had 15 years ago. Now when you look at that challenge today it will appear different, you may even laugh at yourself for having thought of it as a challenge. You will have most likely credited that different outlook to getting older instead of gaining a new awareness, but it still is a new awareness. That is what every challenge presents to you, an opportunity to find a new awareness; and having a great vision or business idea is not going to unfold without you learning to develop your mastery, through those challenges. It’s saying learn to schedule time for what is really important to your purpose. It’s saying learn to recognize the support for all your needs as you journey through life. It’s saying you are not quite convinced yet of your dream, which is why you have laid the blame on not having money. It's saying love yourself enough to allow yourself to shine no matter what people think. It’s saying free up some of that time you spend on dead things and focus on the higher calling in you. It’s saying don’t concentrate on how many times you tried and failed, concentrate on what you want to achieve, nothing else matters. 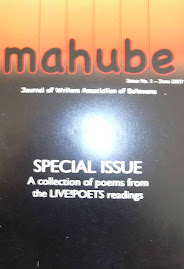 Here is the second story from the Mahube submissions on the theme of "water". This is from our WABO member, Wada Goitsemang. When I was a child, I loved the rain. It settled the dust, each falling drop brought down dust in one heavy pounce. I remember running into the rain and spreading my arms out with a freedom only childhood innocence and imagination could allow. I remember wondering where rain came from, and if the earth could ever be soaked up with rain the way a sponge gets soaked sometimes. I brushed the thought away the moment I saw rain butterflies. I would run after them and sing,''Rain rain, butterfly.'' I loved the freedom they seemed to possess. That was then. My joy has been washed down by the rain. I am no longer who I used to be. We sit opposite each other. A foreboding silence killing every attempt to spark conversation. Our last 'discussion' was about rain. Whose god had allowed the rain to fall? My people had been in church petitioning, fasting, praying for the rain. His people had gone to the mountains, they had danced to the god of water. Who had more power? Our son, lying in bed, sick with a high fever was dying. The new doctor, whom they said knew everything, said nothing could be done. They said that when he said so it was best to prepare for the funeral. I told them, God was smarter than him, he would not allow my son to die, he could not. The basin of water that was prayed for by the priest would heal my son. It had to. The bottle of anointed water had to. My husband said, his father's gods were angry. We had to perform the ritual of cleansing. Our son should be taken by the riverside at night to be cleansed in the waters. I could not say a word to him, did he want to kill our son? I could not understand how in the world we got here. Once, two years ago, water had united us. He had washed my hands and I, his; a symbol of how we would always take care of each other. We had been blessed with a son. Now it seemed I was washing my own hands, him his. He had fathered a son. I had mothered a son. Rain had poured to bless the union, rain now poured to mock it. Was this torrential storm ever going to have a rainbow at the end? We needed to be saved from the flood. Bio: Wada Goitsemang is a 24 year female currently pursuing a science based medical course but whose first love is the arts. She writes poetry and short stories in her spare time. Her work has a tinge of rural Botswana since she was raised in a rural place and later moved to the city in pursuit of her degree. Her background enables her to bring a rich cultural background to her work which allows her to relate to Batswana in both rural and urban places. Her work also reflects the religious influences that have impacted on her. She was originally raised in an African traditional religious family, to seeing her family embrace Christianity and having schooled in a Catholic school at the prime of her youth led to the consolidation of her moral and religious values. Brand Botswana will be at our AGM this Saturday to talk to writers about opportunities that are available for Batswana writers to be part of the 'Our Pride, Your Destination". Do not miss out on this chance to find out more about Brand Botswana's vision for the literary arts. Remember the AGM is this Saturday at 2 pm in Gaborone at Maruapula School.